Adrienne, mother of two and NAZ parent, has come a long way in a short amount of time. 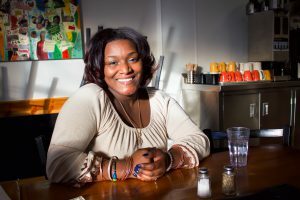 With support from her family achievement coach Lucretia, early childhood support from Northside Child Development Center, and Project for Pride in Living her life is dramatically different. A few years ago, Adrienne was lost. Her first son, Achilles was still in diapers and her second, Prince was on the way. “I had a lot of things going on. I was dwindling in addiction.” She was in a tumultuous romantic relationship and not able to hold down a good job. Because of the nature of the check fraud, Adrienne was placed on federal probation. Adrienne also violated her probation, so while recovering from the birth of her son she was informed that Federal Marshalls were looking for her. She was allowed to turn herself in, but without knowing what was going to happen to her when she did. Adrienne’s scholars were enrolled in New Horizons when she heard about NAZ and started working with a Lucretia, a NAZ Family Achievement Coach. In our College Bound Babies and Foundations classes, she was able to learn and tap into a healing community. Adrienne has worked extremely hard. She now works at a job she loves at Breaking Bread, she has custody of her two sons, and NAZ partner People for Pride in Living has partnered with her with a new place to live, on her own.